Araña is a New Orleans-based restaurant that reflects both authentic and modernized Mexican cuisine using techniques inspired by the culinary traditions of the Yucatan. Araña created the Araña Tequila Society (ATS) to educate, entertain and engage tequila enthusiasts. The free spirits club allows customers to taste Araña’s array of tequilas and receive rewards and exclusives along the way. In order to generate awareness and gain members, Bond created Tequila Week, a five-day celebration in conjunction with Cinco de Mayo (May 4 – 8, 2015) announcing the launch of the ATS. Tequila Week featured ATS sign-up information, well-known tequila ambassadors crafting inventive cocktails for guests, tequila specials and prizes and throughout the week. o Generate 100 Tequila Society memberships during Tequila Week (5-day span). o Record top restaurant attendance and sales during Tequila Week (recorded by week). o Increase general awareness of Tequila Week, the Araña Tequila Society and its unique offerings among our target audiences. o Secure local media coverage surrounding Tequila Week and the Araña Tequila Society. o Increase Araña social media reach and engagement during Tequila Week. 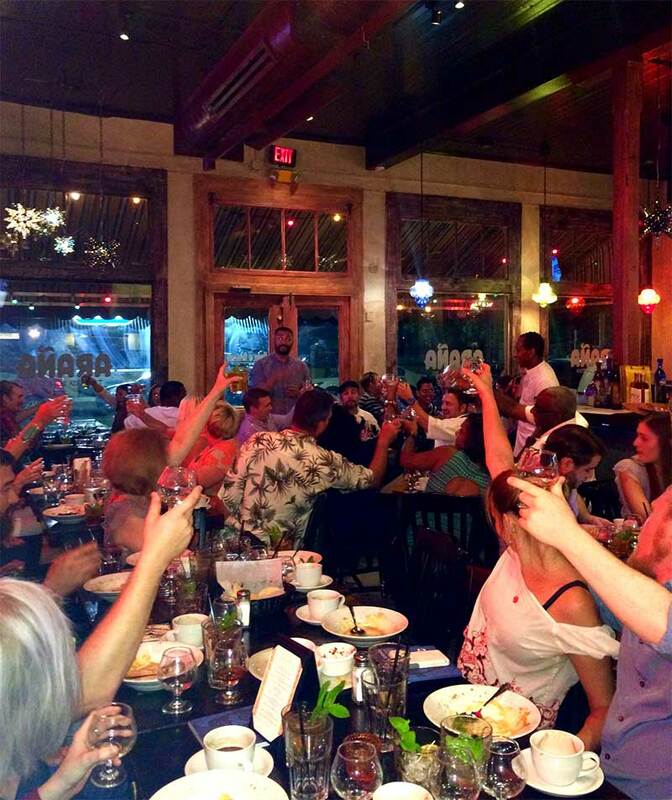 Daily on-site tequila tastings were hosted by well-known tequila ambassadors. Araña staff managed the “Tequila Society Sign-Up table” to educate visitors and encourage sign-ups (Bond created talking points and flyers for staff members). Free “swag” was distributed to ATS members who signed up during Tequila Week. Customers who become ATS members during Tequila Week were entered into a drawing to become the “Tequila Society VIP”—this VIP member received $25 monthly bar tabs for one year. Music, food and drink specials were available for all restaurant visitors on Cinco de Mayo. From May 4th – 8th, Araña was able to gain over 150 Tequila Society Members (50+ members over original goal). Araña’s sales from May 4th – 8th totaled $30,000, breaking its highest weekly sales record since opening. Bond secured 15 media features promoting the Araña Tequila Society and Tequila Week. Select outlets include The New Orleans Advocate, Babes and Beignets, Eater Nola, GoNola.com, MyNewOrleans.com, New Orleans Local, Nola Tidbits, Times Picayune, WGNO-TV, WUPL-TV, WWL-TV and WYES-TV. Bond’s Tequila Week posts on Araña’s Facebook page from May 4th – 8th alone had a combined reach of over 18,000, over 650 likes/comments/shares/fans and 1,244 post clicks. Total reach increased by 17% to 29,094. Total engagement increased by 5% to 1,306 people. We won a Public Relations Society of America New Orleans Silver Anvil award for the campaign – the highest award in the industry.